» Are Blueberries Good For You? Fermented fruit is delicious and berries work really well together. I usually mix blueberries, raspberries and blackberries, when they’re all available. There’s lots of information out there. Here’s a little round-up with some interesting facts about this teeny weeny berry! See the photo above? I can’t recall my recipe for this one – oops! – was playing around in the kitchen last summer. 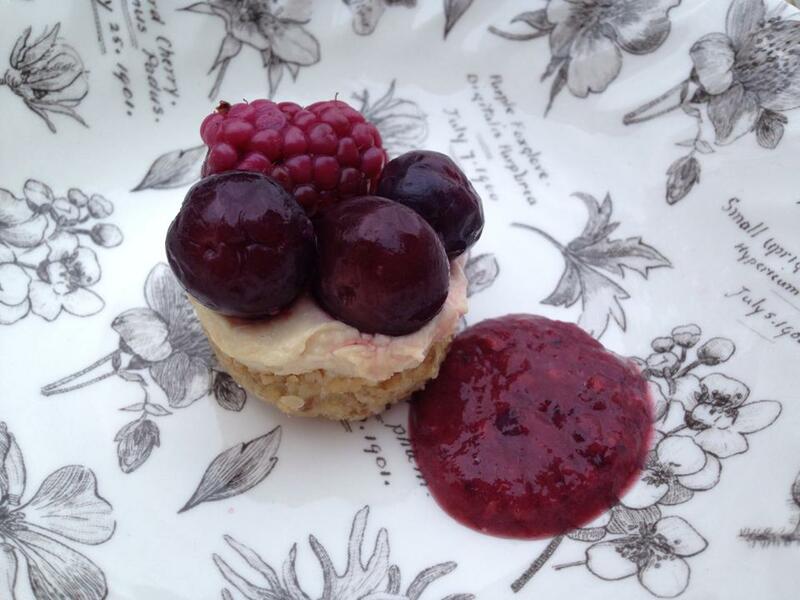 It was a basic raw cheesecake .. no cheese involved .. topped with fermented raspberries and blueberries and accompanied by a fermented, mixed raw fruit coulis. Sooo scrumptious! Pour your clean blueberries into a clamp down jar. I’ve also added a teaspoon of ginger ferment, to give the berries an extra kick of flavour. I love this and it’s easy to do if you keep a jar of fermented ginger in the fridge at all times, ready for juices and smoothies. Just use a teaspoon of the fermented water. Leave for as many days as they take to ferment. The warmer the room, the quicker it will happen. On their own, I’ve found that blueberries can take longer than when mixed with softer fruits such as blackberries and raspberries, which can take from as little as 24 hours in the heat of high summer .. up to 3 days in cooler weather. Remember that, however you heat your home, your usual rooms won’t retain a steady temperature day and night during the hot months so keep an eye on your ferments and don’t be surprised if blueberries take up to a week during winter. When ready, the water will become a little bubbly and the berries will taste tart and slightly fizzy. Some people say that stainless steel is fine. No other metal should be used, although it’s ok to have a metal lid, so long as the lid doesn’t touch the ferment. Metal, as a rule, can leach chemicals when it reacts with ferments, which are acidic. Choose your vessel with care. I love to see through clear glass, so I can keep an eye on my ferments and, consequently, can’t be dragged away from my beloved clear, clamp down jars! Go with whatever suits you. What Can You do with Your Berries? Make a fruit coulis to add to puddings, ice-creams, sorbets, cheesecakes and more. Top your breakfast muesli with them. Pour a few into the scooped out serving of a fresh melon, add some fruit coulis, a little crumble crunch, a drop of yoghurt and BOOM, you’re in heaven! Have you tried fermenting fruit yet? I love blueberries and have them almost every morning as part of my breaky. But I can’t say I’ve tried them fermented. Bon appetit! Sarah – Would a mason jar work? We love blueberries and would love to try fermenting them ! Absolutely! Just keep in mind that you don’t want any food touching a metal that can leach chemicals. The acidic nature of ferments means that metal can leach during the fermentation process. With that in mind, keep the level of the ferment well below a metal lid or use a glass or food grade plastic lid.